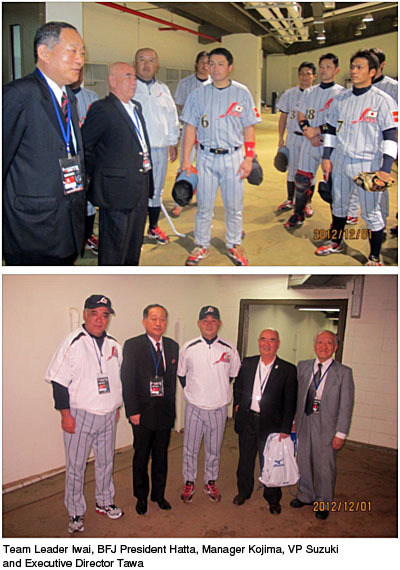 (Taichung) President Eiji Hatta of Baseball Federation of Japan visited the locker room of Team Japan on December 1 evening before the start of the night game against Korea, the two undefeated teams of 26th BFA Championship to put spurs for the Team Japan to continue winning streak. Dr. Hatta is President of Doshisha University, established in 1875, is one of the most prestigious universities in Kyoto.. Team Japan won the game 4 – 0 (see the Day 4 report) and will play final game of the Championship against China at Intercontinental Stadium in Taichung on December 2.